By default, the p2 Install Software Dialog groups all the installable units by category. 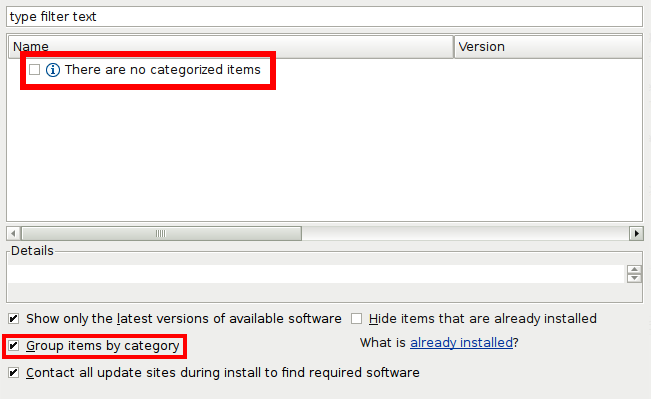 If an installable unit is not categorized, it will not be displayed in the user interface. There are currently two supported methods for categorizing content. A category definition file is an XML file that describes which categories a feature should be listed in. The category definition file can be edited using the Category Definition Editor. The category definition can be specified when exporting a feature, building using PDE Build, or injected into a repository using the category publisher. The p2.inf file is a properties file that can be used to customize capabilites, properties, and instructions. Information about this provisional file is available in the section Customizing p2 metadata.